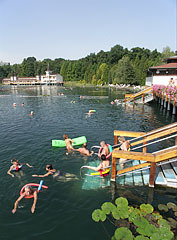 The city was named after its hot-water thermal springs. The world’s largest medicinal lake with volcanic origins can be found here. Only New Zealand can be proud of such a lake of similar size. 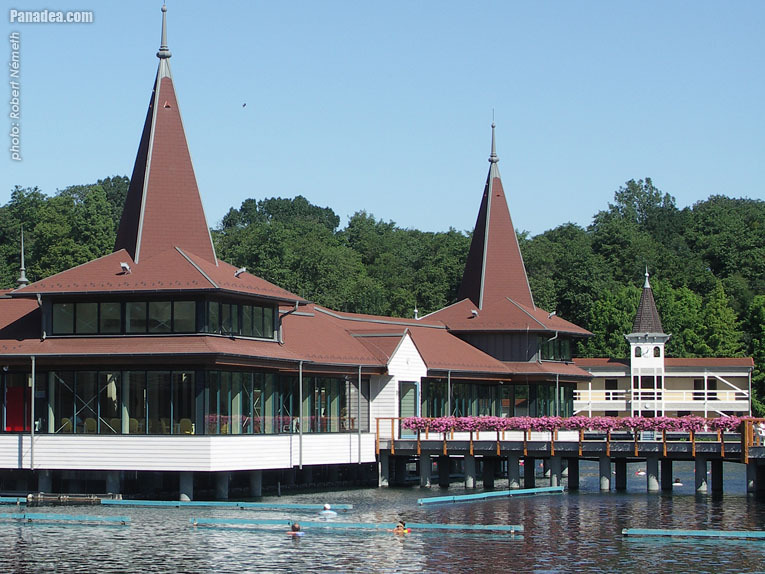 People hoping to be cured are attracted not only by this hot-water lake and its 50 hectare forest, but the city’s climate is almost Mediterranean with a relatively higher average temperature than the rest of Hungary. The city’s medical tourist industry is more than 200 years old. 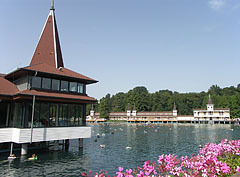 The area around the lake was inhabited even in the Roman times. During excavations the ruins of a Roman villa were discovered. The area used to be marshy owing to the water coming from the lake. During the 17th century operations were carried out to set up mills and exploit the possibilities offered by the water. The hot water was utilized by the leather industry as well. 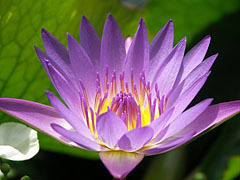 The medicinal significance of the lake was discovered at the end of the 18th century. On colder mornings, this hot-water lake is covered by steam, which prevents the lake from cooling down. 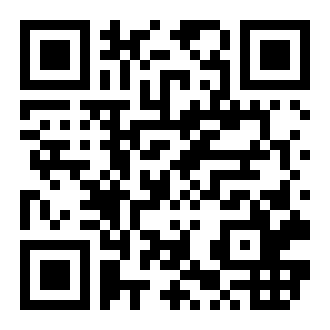 This way it is possible to bathe in it during the whole year. Its beauty is made more striking by the Indian white and red water lilies floating on the surface, brought here by Sándor Lovassy in 1898. The lake is 38 metres deep and 86 million litres of water erupt daily from the many thousand year old karst springs, which are of different temperature. When bathing, your body is covered with bubbles, during which minerals stick to the skin and provide healing effects. Its Sulphur content makes it possible to cure Rheumatic problems and sports injuries. 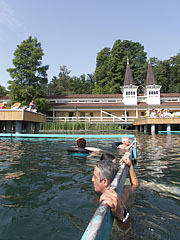 The bath at Hévíz was established at the end of the 18th century, and the use of the water for medical purposes is attributed to György Festetics. The bath was supplemented with its twin-towered entrance during the 20th century. Not far from here two houses were built, still functioning under the name of ’Hetesház’. 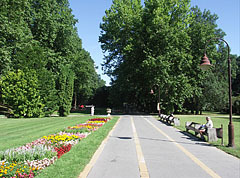 Among the huge sycamore trees of the Schulhof Promenade, leading to the lake, visitors can find different works of art. It is also possible to have a nice walk on the way-marked roads in the forest, breathing in the clear healthy air. 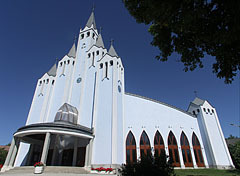 The Church was built in the years between 1996 and 1999 to the plans of architect János Bocskai, mixing the Gothic and modern style. The old church was located on the outskirts of the city. It proved to be too small, in spite of the several enlargementsand it was not easy to approach. Beside the two old bells, it received two new ones as well, which were made in Őrbottyán. Its tower symbolises the gifts of the Holy Spirit (Wisdom, Sense, Knowledge, Humbleness, Strength, Good Advice and Fear of God). From an aerial view, the church itself stands for the Holy Spirit as well with its shape of a dove with spread wings. The stone church in Roman style built in the 13th century and mentioned for the first time in 1341, is really worth a visit. It is a good example of the small churches made of sandstone which were quite popular here. Its tower is topped by an octagonal cap. The road near the church leads to a late Roman grave from the 4th century, which should be visited as well. It became clear after archaeological excavations that the area was inhabited until the end of the 5th century, and the finds are exhibited here. Built here in the 2nd century was a stone house, of more than 1000 square metres, and it even had a pool with cold, lukewarm or hot water. A Mithras altarpiece was set up in the 3rd century, the altar stone of which was found by archaeologists. In the 4th century the building was destroyed, but later, in the 5th century it was re-built and used for economical purposes.